"Even if you think you don't like asparagus you have to try this. 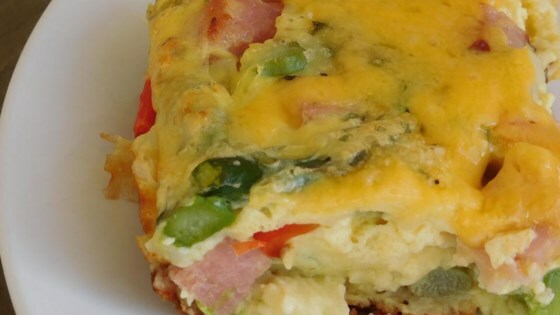 It is a wonderfully easy quiche-like casserole to throw together for breakfast. This can be prepared the night before, covered, and put in the refrigerator overnight. Just be sure to allow extra cook time." Preheat oven to 425 degrees F (220 degrees C). Lightly grease a 9x13 inch baking dish. Mix the ham, onion, red bell peppers, and asparagus in the prepared baking dish. In a large bowl, beat together the eggs, milk, flour, Parmesan, tarragon, salt, and pepper. Pour over the ham mixture. Bake 20 minutes in the preheated oven, or until a knife inserted in the center comes out clean. Sprinkle with Cheddar cheese. Continue baking 3 to 5 minutes, or until cheese is melted. Let stand 5 to 10 minutes before serving. This casserole is everything you love about breakfast in one dish. This can be prepared ahead of time, covered with plastic wrap, and put in the refrigerator overnight. Just be sure to allow 15 to 20 minutes extra baking time. This recipe is so good. I decided to put the ingredients into a pie shell for a quiche. Definately had to reduce the ingredients but turned out very well. I can't wait to make it again!